SCVHistory.com | Fallen Officers | McCoy Pyle Murder: Covetous Fillmore Man Fakes Robbery to Kill Popular Constable, 1897. Covetous Fillmore Man Fakes Robbery to Kill Popular Constable. The murdered officer, McCoy Pyle, 29, of the Pyle Ranch at Castaic Junction, was the same man who, as a teenager on May 2, 1884, discovered the most important trove of Tataviam Indian artifacts ever found, at what came to be called Bowers Cave in San Martinez Canyon (now on the property of the Chiquita Canyon Landfill). Read about it here. Shot Dead By a Desperado. A Brave Ventura Officer Killed. Was Caught Off His Guard. The Murderer And His Pal Escape. Running Fight With the Deputy of the Man Who Was Slain. Special Dispatch to the San Francisco Chronicle | May 25, 1897. Ventura, April 24. — McCoy Pyle, a constable at Fillmore and one of the bravest and most popular officers in Ventura county, was shot through the head an instantly killed by a desperado at 4 o'clock this morning. The shooting occurred at the Castac switch, four miles from Saugus, in Los Angeles county, and was done by one of two men who were in the custody of Pyle and Deputy Constable Lineberger for robbing a store at Fillmore the previous night. Particulars of the shooting have so far been meager. Thursday night two robbers entered the room of Ed McCamish at Fillmore, and after beating McCamish severely chloroformed him and robbed him of money and valuables. The victim of the robbery was unconscious for some hours, but when he had sufficiently recovered he notified Constable Pyle and Deputy Lineberger, and they immediately started in pursuit of the robbers. McCamish was able to give a good description of his assailants, and guided by this the officers traced their men to Castac. About 4 o'clock this morning the two desperadoes were discovered near the switch. Pyle and Lineberger succeeded in getting the drop on them. The robbers were covered with pistols and told to throw up their hands, which they did. It was quite dark at the time. Lineberger proceeded to handcuff the prisoners, Pyle all the while keeping them covered with a pistol. Lineberger succeeded in handcuffing one of the men, and was about to search the other when a shot was fired and Pyle fell dead with a bullet through his head. It is supposed that the constable in the darkness was off his guard for a second, and that the robber with his hands still free took advantage of his opportunity to kill Pyle and make a further fight, if necessary, for freedom. Then ensued a short, sharp running fight between Lineberger and the two robbers, who stuck close together and made off in the darkness, firing as they ran. Lineberger emptied his pistol at them and is confident he wounded in the arm the robber who killed Pyle. He then returned to where Pyle was lying, and found him dead, with a bullet wound to the head. Lineberger lost no time in summoning help, and soon the entire country was aroused. Numerous posses are in pursuit, and it seems impossible for the murderers to escape. Excitement is intense, and should the desperadoes be captured by any of the citizens' posses in pursuit, the county, in all probability, will be spared the expense of a trial. The murder of Pyle has aroused intense indignation throughout Ventura county, for, as stated above, the dead officer was known as a man to whom fear was unknown, and who had made an enviable record as an officer. Pyle was 29 years old, true to his friends and generous to his enemies. He leaves a widow and three young children. Fillmore, April 24 — 11 P.M. — The body of the murdered constable has just arrived from the scene of the tragedy, but so far no trace of the murderers has been found. Posses from this and Los Angeles counties are still in pursuit, and strong hopes are entertained of capturing the murderers. Santa Cruz Evening Sentinel | September 29, 1897. Los Angeles, Sept. 28. 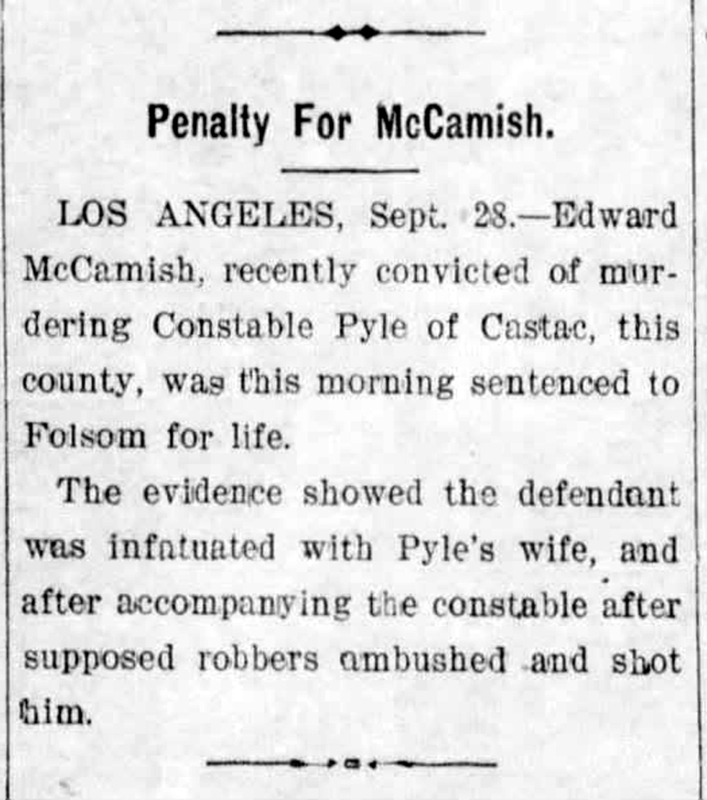 — Edward McCamish, recently convicted of murdering Constable Pyle of Castac, this county, was this morning sentenced to Folsom for life. The evidence showed the defendant was infatuated with Pyle's wife, and after accompanying the constable after supposed robbers, ambushed and shot him.